Demetrius Andrade makes his first title defense on DAZN. 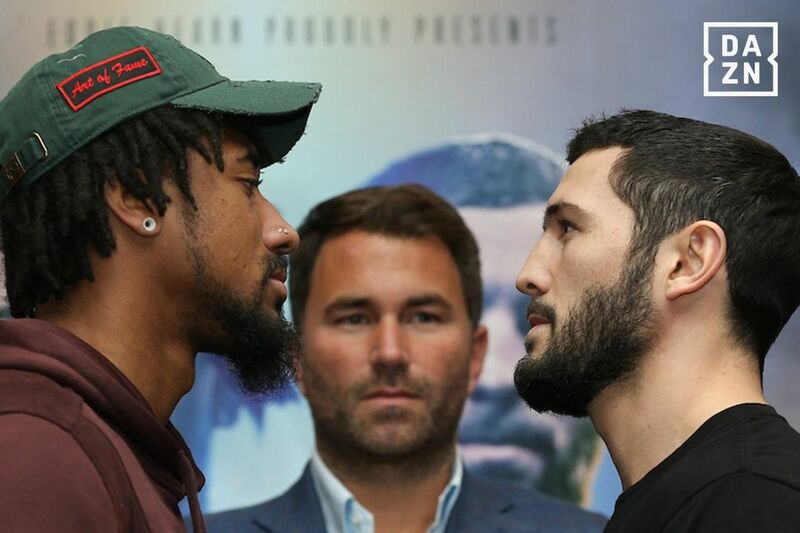 Tonight at 7 pm ET streaming live on DAZN, Demetrius Andrade returns to the ring to make his first WBO middleweight title defense against Artur Akavov in the main event from Hulu Theater in New York. Andrade (26-0, 16 KO) won the title last October, beating Walter Kautondokwa in Boston for the vacant belt. Akavov (19-2, 8 KO) has had a shot at this title before, losing a decision to Billy Joe Saunders back in Dec. 2016. Andrade is the heavy favorite here, but Akavov has managed to make a title fight closer than expected before, too. To stream Andrade-Akavov, sign up for DAZN and receive one month free! On the undercard, Jorge Linares (45-4, 28 KO) returns to face Pablo Cesar Cano (31-7-1, 21 KO) in a junior welterweight showdown; IBF super bantamweight champion TJ Doheny (20-0, 14 KO) defends against Ryohei Takahashi (16-3-1, 6 KO); Chris Algieri (22-3, 8 KO) takes on Daniel Gonzalez (17-1-1, 7 KO); and Amanda Serrano (35-1-1, 26 KO) faces Eva Voraberger (24-5, 11 KO) for the vacant WBO super flyweight title. Wil Esco is on the call tonight. Join us!